Leading Manufacturer of ambient vaporizer, mobile type vaporizers, steam water bath vaporizer, aluminum cryogenic vaporizers, pressure building vaporizers and high pressure ambient vaporizers from Vadodara. We are the leading manufacturer, exporter, supplier and service provider to offer our prestigious clients an optimum quality range of Ambient Vaporizer. Our provided vaporiser is well manufactured under the guidance of our highly experienced professionals using premium grade raw material and modern technology. 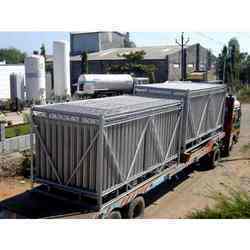 Offered vaporiser is widely demanded by our clients owing to its suitable usage in various petrochemical industries for some specific purposes. We offer a wide range of Mobile Type Vaporizers mainly for field applications. Mobile Vaporizers are offered in an aluminium frame or galvanised frame or SS 304 structure frame as per customer’s requirement. 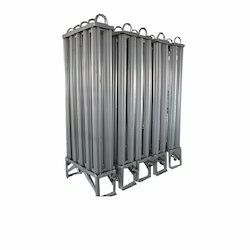 All units have top-Aluminum net for protection. All units have forklift channels at the bottom. Steam Water Bath Vaporizers (SWB) are designed for the vaporization of cryogens such as oxygen, nitrogen, argon and LNG.This vaporiser consists of the horizontal steel tank, tube bundle type of heat exchanger, steam manifold and controls. The SWB is particularly suited for high cryogen flow rates were consistent temperature is required in the process flow. This type of Vaporisers occupies very less space. Steam is sparged into water retained horizontal tank, heating it to the required temperature; cryogen is vaporised through the tubes by direct contact with hot water. 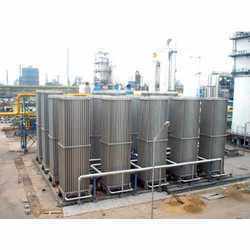 Two or three streams of different liquefied gases can be treated in a single unit. Cost-effective standard vaporisers for N2, O2 and Ar are available. Possibility for cleaning and inspection attained by a removable tube bundle. Robust and reliable design for a Long lifetime. Due to an optimised steam injection, steam hammering and erosion are avoided and the sound level is minimised. The tube minimises material stress and enables fast load and temperature changes. IWI India offers a wide range of natural draft ambient Aluminium Cryogenic Vaporizers to meet the varied requirement. All the vaporizers are manufactured using the aluminum material of different grades for different parts and offer flexibility in the duty cycle for any. All aluminum construction of Pressure Building Vaporizers for any given withdrawal rate and duty cycle of 8, 16, 24 hours or nonstop continuous application for maintaining tank pressure round the year. 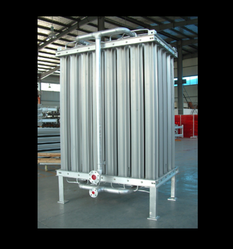 Design available for PB Coils for Storage Tanks, Transport Tankers & Semi-Trailers. High-Pressure Ambient Vaporizers are available with Aluminum Fins with Lining of SS, Brass, Copper, Copper Nickle (90:10) Monel and used for different Gases. We offer a wide range of Natural Draft Ambient Aluminum Cryogenic Vaporizers to meet the varied requirement. All the Vaporizers as Single module are available from 20 Nm3/Hr to 6000 Nm3/Hr are manufactured using the aluminium material of different grades for different parts. We offer a wide range of Vacuum Jacketed Pipe.